Sometimes, I long for the days of Transformers: Stormbringer, when IDW’s Transformers titles had one writer who kept the story along a simple path. Since then, a variety of writers have made the franchise uneven and hard to follow, which in the world of Transformers is not a good thing. An attempt to clarify everything, called Transformers: Continuum, was so bad that the continuity fell apart even more. In the midst of the seemingly interminable All Hail Megatron and the fair-to-middling ongoing series, IDW decided to reach out to the long-term fans (myself included) with Last Stand of the Wreckers. Written and drawn by two staunch Transformers fans from the United Kingdom, Wreckers concentrates on the titular Autobot assault team. The Wreckers are known for two things: charging head-first into dangerous situations, and dying in droves because of it. Despite an incredible amount of fatalities, there are numerous applicants, and the series follows four of these recruits. Like the majority of characters in this story, Pyro, Guzzle, Rotorstorm and Ironfist are based on obscure Generation One toys and are characters with almost no previous exposure. Along with their rookie status, Pyro brings an Optimus Prime-like desire to be a leader; Guzzle brings a warlike nature; Rotorstorm brings a cocky attitude; and Ironfist brings pure, fanboyish glee. Amongst the fandom, Ironfist is the breakout character, conveying a fan’s point of view both in-universe and for the fans themselves. Mind you, there are also more well-known characters in the cast, albeit characters from the later years of the original series. Leading the Wreckers are Springer and Kup, with Perceptor, Topspin and Twin Twist along for the ride. Much like in Stormbringer, Megatron only appears in flashback; Prime is nowhere to be seen, and the most notable cameos from older Transformers are Prowl and Shockwave. The Wreckers are up against Overlord, a villain so deranged that he even terrifies Kup, the man with a million stories. He is obsessed with combat and rule by the strong, and like the Wreckers, his forces are mainly comprised of unused toy characters. Writer James Roberts and writer/artist Nick Roche pull off an incredible feat: making the reader care about the story despite having few notable characters. Even Stormbringer, for all its cameos, was mostly about Optimus Prime and Thunderwing. The authors use the toys as a blank slate for new personalities. They even made an annoying human character, Verity Carlo, into an entertaining, plucky sidekick. This is all accompanied by a heavy dose of action; at some points, it seems like the entire story is one huge action scene. This is thankfully broken up by a dilemma posed by the Wreckers’ own violence, and the nature of death and sacrifice in the Transformers franchise comes to the forefront. Roche’s art is extremely kinetic and expressive. When it comes to Transformers, many of them lack a mouth or independently moving eyes, and it can take some work to display any emotions. Pat Lee’s Dreamwave Transformers series is the epitome of this “dull surprise” syndrome, but other artists slip into it as well. But Roche’s version of Stalker, who lacks any sort of human facial features, still displays his maniacal glee as a torturer. Towards the end, the art can get a little too complicated; Overlord’s defeat, for instance, is not helped by red backgrounds. The extras in this version are glorious. Wreckers was initially offered as a trade paperback which contained some extras and a few profiles on the characters. The individual issues shipped with profiles of their own. IDW claimed that this was to encourage readers to buy both the issues and the trade. This was a problem when Wreckers issues became hard to find after their success; the hardcover and trade are hard to find as well. Thankfully, the hardcover collects the profiles and much, much more. There are two prose stories, “Bullets” and “Out Of Bullets,” which convey essential pieces of the backstory, as does a one-page “Mosaic” comic initially published online. After the profiles are a cover gallery; excerpts from previous script drafts; tribute art from other IDW and Transformers artists; a text feature on Squadron X, the Wreckers’ evil counterparts; a post-script comic from Nick Roche; house ads; a page of commentary on the comics; various sketches from Roche and colorist Josh Burcham; a one-page synopsis of the original concept; a post-script text story; and a second post-script comic by Nick Roche. 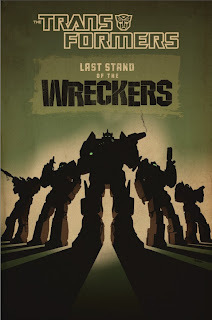 I’m struggling over whether to recommend Last Stand of the Wreckers to those not heavily versed in Transformers lore. On the one hand, the cameos and links to previous IDW stories are key to the story. On the other hand, the strong characters and unfolding plot are captivating. Considering the ridiculous amount of extras for only ten dollars more than the trade, if you’re interested in Wreckers, get the hardcover if you can. The story will also be available in IDW’s massive Transformers: The IDW Collection Volume 6, but unless you’re interested in the ongoing, you’d be better off getting this individual collection. The Wreckers was a fantastic book. I'd like to track down the hardcover at some point. I know the series was really popular, have they mentioned if another Wrecker story is in the works? The Trevor Hatchison covers are brilliant.